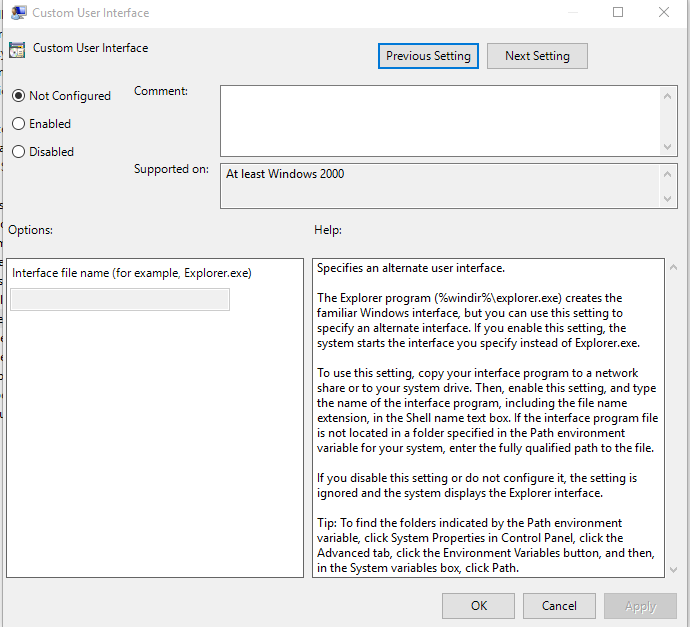 SCCM - OSD - PowerShell Tips: Kiosk Mode in Windows, Overcoming the Issues. Kiosk Mode in Windows, Overcoming the Issues. 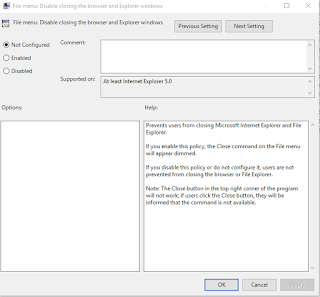 I was recently tasked with setting up a line of "Kiosk" machines (running Windows 10) to serve just internet explorer to users, with no access to other applications. From Windows 8.1 you can use Assigned Access . This may have worked well in Windows 8.1 however from my testing i could not get Edge as assigned access only works for "Apps". In windows 8.1 IE could run in "Metro app" style therefore may have worked. Internet Explorer can be run in "Kiosk Mode" (iexplore -k). This is fine if you were using the Kiosk for a single website however does not allow users to easily navigate to other sites. This approach would work fine for a Library catalogue machine or similar. 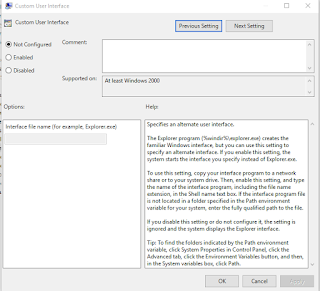 The approach i ended up taking was to take advantage of an old group policy called "Custom User Interface". This is located in User>Admin Templates>System. With this approach you can replace explorer.exe with iexplore.exe and you are away, of course you would need to lock the machine down with settings like "Remove Task Manager" etc but this approach works well..
Of course within a Kiosk environment i would like to prevent the users from being able to close Internet Explorer, because if they would there would be no way to restart it besides rebooting the machine. There is one major issue i encountered with this Policy, when users opened new tabs for webpages, it sometimes prevented the users from being able to close those tabs (users would receive a restriction error), therefore this setting would not work in a shared lab login environment. My thought was that this policy was initially designed before tabbed browsing became a thing and has not been updated to be able to handle tabs, "Supported on: At Least IE5 led me to that thought"
The solution was simple, build what under other circumstances would be the most annoying program ever. "Loop IE" is simple, it will run as a hidden process and force open iexplore.exe every time its closed after a delay of 5 seconds. Edit: Updated below version to v2. Download and then place the file on the machines local disk (eg c:\Program Files\LoopIE\LoopIE.exe). The settings file controls two options. There you have it, users can close IE however it will come back, forever! Here is a report of the group polices i have applied to my Kiosk OU.